The MWAS Scholarships for athletes, coaches and officials will be officially awarded at the scholarship launch to be held at the Geraldton Universities Centre on 12 February. The February newsletter will contain details and pictures from the evening. For now we make note of a couple of the new entrants to the MWAS and show why they will be fun to follow as they continue to move up the athlete pathway. Caption: Flynn Scott holds up his under 13 state 200m freestyle gold medal. The MWAS is happy to welcome swimmer Flynn Scott to the academy. 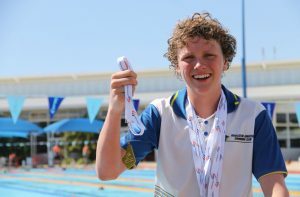 Flynn’s performances at the WA State Open long course championships in December 2015 were impressive, including a state title for his 13 years age group and four other medals. Flynn was most happy with his 200m Individual Medley performance “somehow I took five seconds off my heat time and medalled” Flynn recounted. “I think going into the final there was more at stake and I found something extra”. The MWAS is looking forward to working with Flynn and his coach Craig to provide the best possible training environment for him as he progresses in both swimming and schooling. In addition to assisting with physical preparation the MWAS also runs programs in sports psychology and life balance that will help Flynn to balance eight pool sessions a week and dry land training with life as a student, family member and 13 year old having fun! We will follow Flynn’s fortunes on his next significant challenge the Australian Age Swimming Championships from March 28 to April 4. 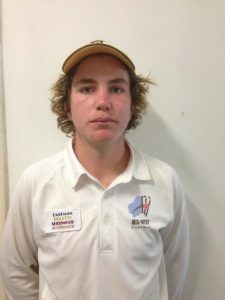 Another new MWAS scholarship holder performing well is Ringo McKenna from the sport of cricket. Ringo has played a lot of competition cricket over the last six weeks including Bunbury, Country Week, U15 and U16 state carnivals and made a good fist of it. He returned impressive figures of 4 for 13 from 10 overs and 1/16 from 8 overs at the U16s tournament. Coach of Ringo and also new MWAS coaching scholarship holder, Jack Little, noted that Ringo “bowled really nicely with the new ball and many of the wickets he took were top order batsmen”. Ringo’s economical bowling also assisted the other bowlers to take the wickets of frustrated batsmen at the other end. Ringo is committed and working hard to ensure his performance is consistent and will be constantly improving. “The challenge now is for Ringo to harness his skills and execute the right deliveries when required” said Coach Little. MWAS will be able to help Ringo to build a physical resilience to go with this great attitude that will allow him to continue the hard work necessary to make it to the top of his game.